1- Run PDF Page Delete, and open your PDF file and then you can see all page numbers in the list. 2- Select the page numbers you want to remove, then click "Delete the Selected Page(s)" button. If you want to select more than one page, please click & drag on the file list, or use CTRL to select more pages to delete. 1- Run PDF Page Delete program, and open the PDF document you want to delete pages from. 2- Click on the "Delete Odd Pages" (if you want to remove even PDF pages, please click "Delete Even Pages"), then you will see all the odd PDF pages would be removed instantly. 3- Click "Save" button to export the left pages as a new PDF document. 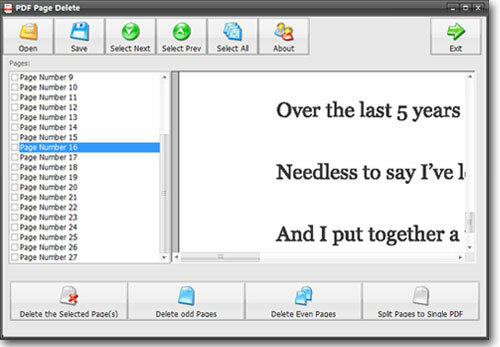 1- Run the PDF Page Delete application, and open your PDF file which you want to split. 2- Click on the "Split Pages to Single PDF" and you will see the splitting start immediately. 3- Once the task complete, you could follow the hint window to find the folder contains split PDF pages. 1- Run the PDF Page Delete program, and open your PDF document which you want to split by the page range. 2- Hit the "Split Page Range" button and you will see the "Split Page Range" window and the message. Please enter the page range you want to split into the blank field and click OK button. For example if you enter "3" then the program will split every 3 pages into one new PDF file. 3- After you click the OK button the program starts the splitting instantly. You could see the progress on the PDF Page Delete main window title, and all the split PDF files would be saved to the "SplitPDF" folder in the original PDF location once done.
" I find this to be a very useful tool. I can check and remove any single or selection of pages from a pdf and delete them, it saved PDF to the same name but with an addition so it did not overwrite. I can remove odd or even PDF pages with one click. With one click of the split to single PDF button at bottom it saved every page as its own pdf in a subfolder. And with split page range, I could split say every 3 or every 5 pages to separate pdfs, and worked with dozens of pages quick. It works perfect and fast!"